VMPS801 is a program which can be used in conjunction with the VICE C64 emulator. 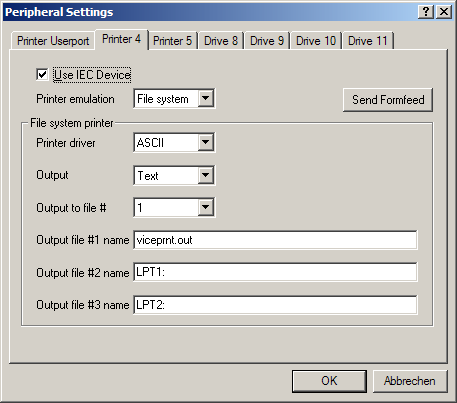 The purpose is to simulate a Comodore MPS801 matrix printer connected to the emulated IEC port of the emulated C64. The output of VMPS801 is not physically printed; instead, it is saved as a sequence of PNG image files. Download VMPS801 (precompiled binary for Windows, current version 0.1 beta 4, updated on 05-Apr-2005), if you believe that you need it. Source code available upon request. VMPS801 requires an installation of ImageMagick to run (DLL version). For your convinience, an appropiate version may be downloaded from here; the license can be viewed here. ImageMagick is a free (and excellent) software from ImageMagick Studio LLC; for further information visit their web site at http://www.imagemagick.com, http://www.imagemagick.net or http://www.imagemagick.org. To install VMPS801, simply unzip it into your VICE folder (recommended) or any other folder on your disk (alternatively recommended). Make sure to preserve the directory structure. Please note that VMPS801 requires an MPS801 ROM in the PRINTER folder. 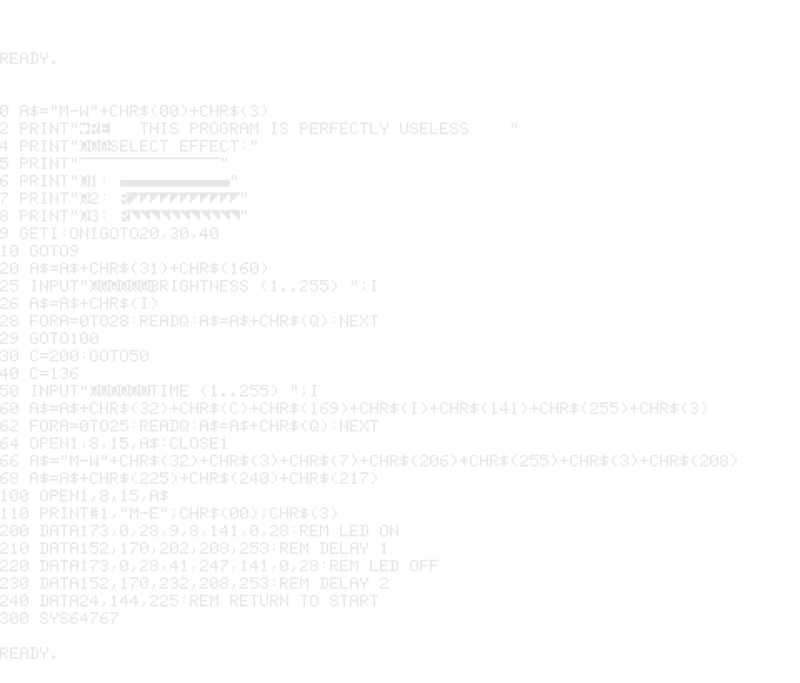 The ROM file which comes with VICE (filename "mps801") is, in spite of it's outer appearance, not an MPS801 ROM! Therefore, VMPS801 brings it's own ROM file (filename "mps801.fake")...which is also not an original MPS801 ROM (for legal reasons), but at least partially behaves like the "real thing" (where it matters). If you own an original MPS801 ROM, you may simply place it in the PRINTER folder, using the filename "mps801.bin" (no need to delete the fake file; VMPS801 will automatically choose the right one). The approach with the different filenames was chosen to prevent confusion and mismatches between fake and real ROMs. VMPS801 is a command line utility. If you don't know what that means, you have a problem. That way, all output which would, on a real C64, go to the printer, now gets recorded in the file "viceprnt.out" (you may choose a different filename, of course). Now get the VICE emulation to print something. If you use a graphic printing program like Koala Printer, choose an MPS801 printer as output device. If you are done, close VICE; this will flush the output buffers (otherwise, the print file may contain incomplete data). VMPS will then generate one or more files with names like "viceprnt.out-001.png". These files contain a simulated graphic representation of the printer out. Unless, of course, a bug strikes. VMPS801 does not simulate the nerve-shattering noise of the original MPS801. This is intended. Thank god! VMPS801 is not a commercial product. VMPS801 comes without any warranty. VMPS801 is designed to overwrite files without asking, as mentioned in the documentation. Make sure that you understood the instructions and explanations. When in doubt, do not use this program. You may contact me via vmps801@stock-consulting.com. Please put the word VMPS801 in all capitals in your subject line (e.g. VMPS801 doesn't correctly print with application xyz). This helps mail splitting and reduces chances that your message is unintentionally deleted, forgotten or lost.